If you have been given a new medication by your health care provider, such as one for pain, it is possible you may see the abbreviation "ATC" on the prescription, especially if you have just undergone a surgical procedure or you have pain from cancer. You may be wondering what that means. ATC stands for "around-the-clock." Around-the-clock (ATC) medication is defined as medication that is given at regularly scheduled intervals throughout the day. This can include a dose during the night. Around-the-clock dosing is common for opioid medication to manage pain. In contrast to medication that is given only as needed (indicated sometimes with the medical code "prn"), ATC medication is ordered by a physician to be given at specific intervals for maximum symptom control. ATC medication is long-acting and helps manage pain consistently. Pain medication prescribed as around-the-clock has the purpose of managing a patient's baseline pain, which is the average pain intensity the patient experiences. This is generally pain that is continuously experienced. This kind of pain can occur in cancer patients, as well as in patients who have just had surgery, such as 24-hours or more immediately following a procedure. An ATC prescription can ensure a steady presence of medication in the patient's system. In addition to ATC pain medication, a patient's pain management may also include medication for breakthrough pain. This is pain that "breaks through" the managed intensity of pain, and is also referred to as "supplemental" or "rescue." This is usually taken when needed and is often an opioid that is short-acting. 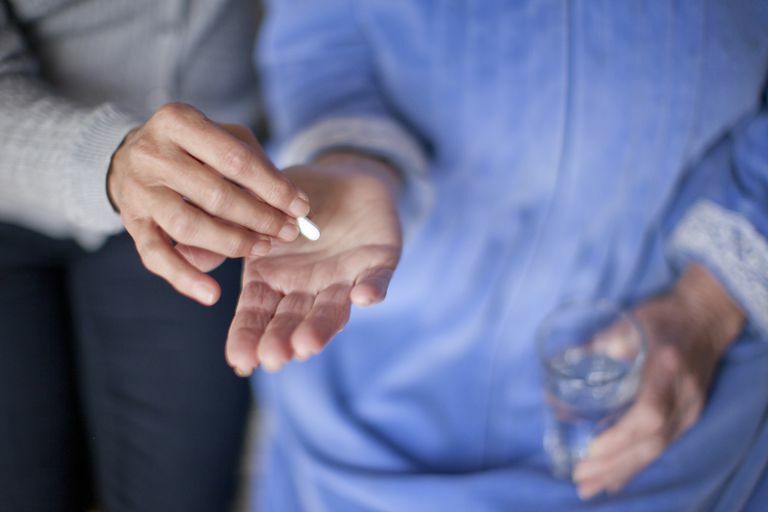 Patients under palliative care may be prescribed ATC analgesics alongside breakthrough medications to manage pain and improve the quality of life. Over prolonged periods, the use of ATC medication can help reduce the ups and downs a patient can experience versus medication taken as-needed. With as-needed pain medication, there is a period of relief, but with this is always the anticipation of the pain's return. The patient can become a "clock-watcher," stressed and fearful that the pain will return before another dose of the as-needed medication is permitted. This can be seen as the behavior of an addict, when, in fact, the patient may not truly be addicted but instead exhibiting a pseudoaddiction caused by the as-needed treatment method. The use of continuous pain medication helps prevent the undertreatment of pain, making it easier on the patient. It has been shown that patients are more likely to stick to an ATC pain management regimen. Also, the use of ATC medication of sufficient dosage and on a regular schedule not only helps reduce severe pain for patients but can also result in a lower dose of medication being needed overall, along with fewer side effects and better pain relief. Patt, Richard B., Lang, Susan S. The Complete Guide to Relieving Cancer Pain and Suffering. 2004. Oxford University Press. Pasero, Chris. Around-the-Clock (ATC) Dosing of Analgesics. 2010. American Society of PeriAnesthesia Nurses.